Last summer, while my sisters were visiting, and we were languishing in the super-hot house we’ve been renting for the last year (which was apparently designed to be a large greenhouse but was converted to a house at the last minute for some unknown reason), my little sister announced that she could make the best chocolate cake ever. Well, Ryan, in particular, was intrigued, and in what I suspect was an effort to instigate her into making this cake, he said he begged to differ and that his chocolate cake was probably better. This escalated into plans for a cake-baking contest, which I questioned as sane, given the already convection-oven-like ambience in our house, but I was quickly drowned out by the excited throng of our collective children cheering in pure ecstasy. Two cakes were quickly baked, and I have to admit, I was skeptical about my sister’s claim. I’m used to Ryan making a cake very fast (he doesn’t strictly believe in measuring, even when baking), but her cake came together in under 15 minutes. It was lightening quick. But guess what? She was right. She can make the best chocolate cake ever. 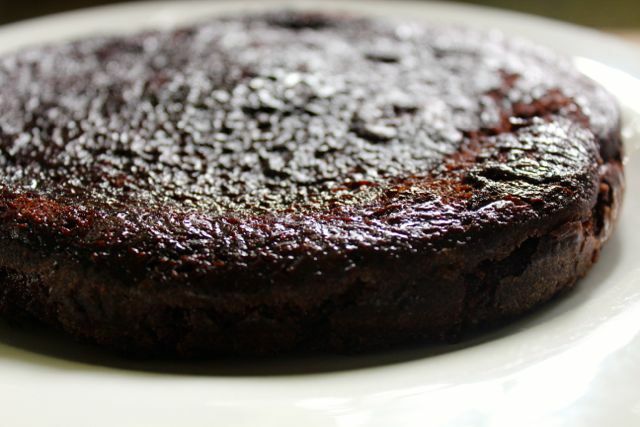 It’s rich and dense and moist and super chocolatey. It’s gooey and sweet but no overly so. 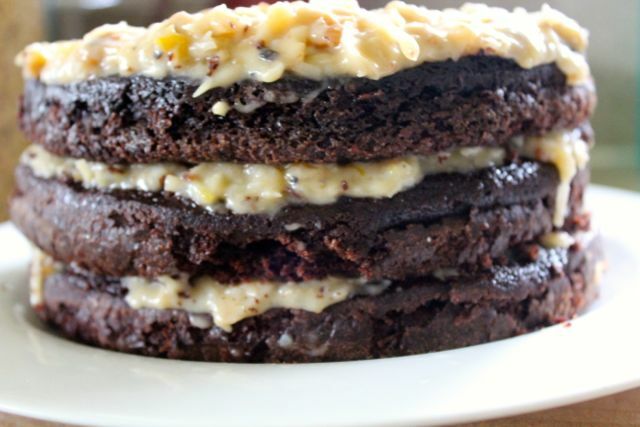 It’s like the best dark chocolate brownies, turned into a cake. Best of all, it never fails. The only way to mess this up is overcook it. This cake has saved me over and over this year, and I think everyone should have it in their arsenal. It’s a fabulous, never-fail base for a fancy dessert when you need to impress but don’t have time. So I can’t really claim any credit for this recipe. It came from one of those recipe-sharing forum sites which I generally avoid, although I’m not entirely sure why. (Maybe because just anyone can post a recipe. Not like a blog where there’s a high bar of legitimacy, namely being able to come up with a domain name…) The genius came in using it for a German chocolate cake, which I’ve been thinking about for a long time, ever since we saw a towering mound of chocolate cake and coconut custard studded with roasted nuts in a bakery we frequent far more often than we should. 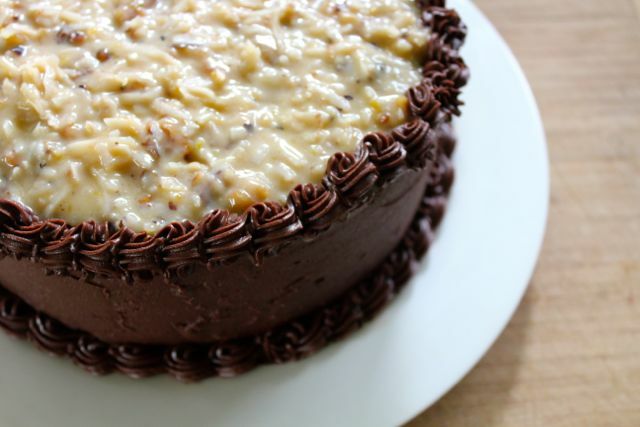 I started my German chocolate quest with a David Lebovitz recipe, as I think you can likely never go wrong with one of his creations. However, after I made it, I found myself longing for a thicker coconut custard and a more intensely chocolate cake. The next time around, I used my sister’s cake and altered the coconut filling. I also used a lighter frosting, as I suspected the richness of a ganache paired with this moist and gooey cake would send us into a coma. This frosting recipe is my mother-in-law’s, who is the goddess of all things chocolate. I’m pretty happy with the combination. It’s best cold with some milk. Actually, a lot of milk. I’ve made it a number of times lately, and when I went totally crazy and decided to host a book group meeting a few weeks before I move and make a trifecta of layer cakes to serve, I decided this one had to be in the mix. In case you’re curious, after much soul-searching, I finally settled on these other two as its compatriots: Strawberry Chiffon Shortcake from one of my favorite blogs, and my all-time favorite, Gingerbread Ice Box Cake, a slice of which is still sitting in my fridge (after being resurrected from the freezer yesterday). Speaking of which, it sounds really good right now, even though my six-year-old daughter, in a moment of total abandon, clawed off the top few layers with her bare hands yesterday, leaving bear-like swipes in the frosting and shards of cookie crumbs on the plate. And this from someone who regularly forgets to wash her hands after going to the bathroom. She was not served a slice after dinner. Also, for further clarification, the reason I made three cakes was because we were discussing Eat Cake, by Jeanne Ray. I’d recommend it if you’re looking for a fun summer read, especially because you might be able to avoid the overwhelming desire to bake cake after cake while you read it if your house is as hot as mine is. Then again, you might not. Also, you’ll note from the pictures that I am not much of a cake decorator and have the great talent of always making crooked cakes. Perhaps I should invest in a cake decorating class. It will help if you put enough liquid into the frosting to get a glossy, smooth finish. You can see here that I stopped just short and, as a result, couldn’t adequately smooth the frosting around the cake’s sides. I prefer this as a three-layer 8” cake, although it will work as a two-layer 9” cake as well. I’m not sure on the cooking time for the cake if you do two 9” pans, so if you go that route, I would check it every three to five minutes after the baking time given below. Also, I have to share one other tip with you: several years ago, I finally learned how to make the top of my cakes turn out flat! I’ve included a little tutorial at the end (because the pictures are so ugly I couldn’t bear to put them up here). 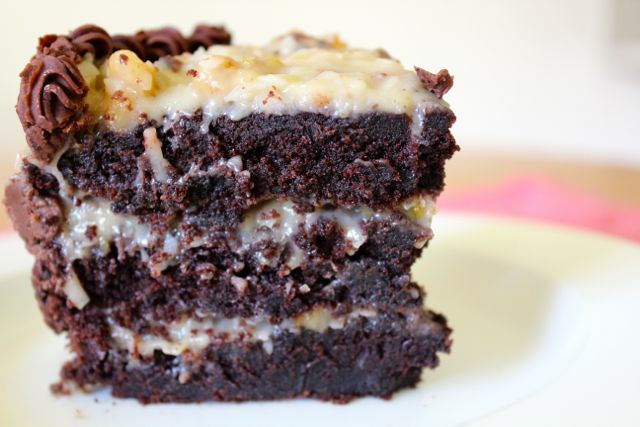 This cake is intensely rich and moist. The coconut custard is creamy and crunchy at the same time, and almost melts into the dense layers of cake it’s sandwiched between. You can make the layers several days ahead of time and then freeze them (after wrapping multiple times in plastic wrap and placing them in freezer storage bags). Take them out a day before assembling the cake and keep them in the fridge until ready to use. The custard can also be made ahead and kept in the fridge for a few days or frozen and thawed before use, as can the frosting, although you will have to bring it to room temperature in order to be able to spread it smoothly. Make sure not to overcook the cake, or it will lose it’s fudge-like quality. Serve cold. Prepare three 8” cake pans. Line with parchment paper, then grease the pans and coat with flour, tapping out any excess. 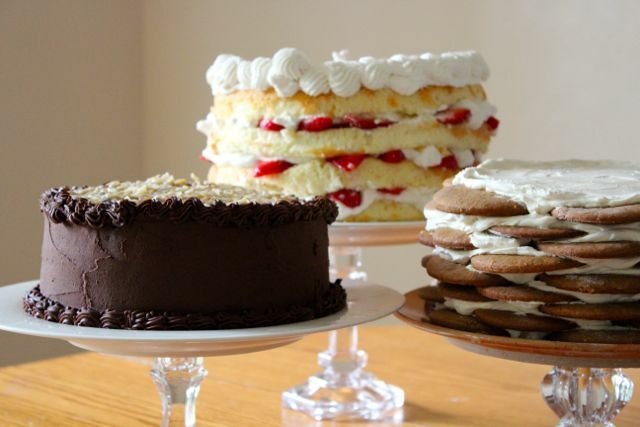 (See below for how to make a special band for the sides of your cake pans which will make the tops of your cakes flat). Preheat the oven to 350 degress with a rack in the middle of the oven. In a small mixing bowl, combine the flour, sugar, cocoa powder, baking powder, baking soda, and salt. In the bowl of a standing mixer (or using a large mixing bowl and beaters), combine the other ingredients. Beat with the whip attachment until smooth, 30 seconds or so. Add the flour mixture all at once, then beat slowly until combined. Turn off the beater and scrap the sides of the bowl. Beat on high for two full minutes. Pour into the pans and bake for 22 to 27 minutes, or until a toothpick comes out clean. Do not overcook (err on the side of gooey). Let sit about 5 minutes, remove from the pans, and let cool completely on racks. Place the cornstarch in a small bowl and set aside. Combine the cream, sugar, and egg yolks in a medium saucepan. Put the butter, walnuts, salt, and coconut in a mixing bowl; set aside. Heat the cream mixture and cook, stirring constantly and scraping the bottom until the mixture begins to thicken and coats the back of a spoon (170-175 degrees). Take the pan off the heat, pour some of the cream mixture into the small bowl with the cornstarch and quickly whisk until there are no lumps. Pour the cornstarch mixture back into the saucepan, return to heat, and stir for another minute or so, until thickened. 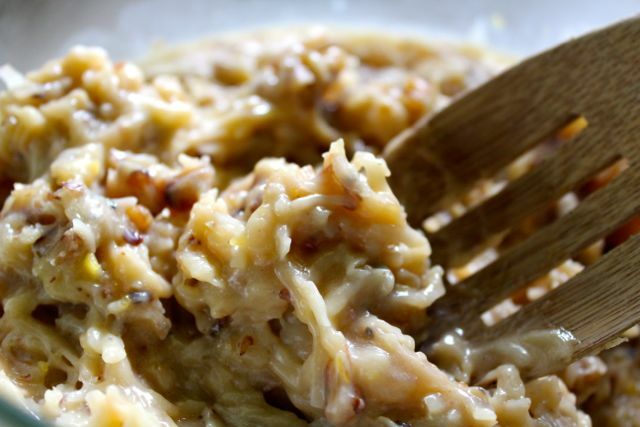 Pour the hot custard immediately into the walnut-coconut mixture and stir until the butter is melted. Cool completely to room temperature. The mixture will thicken more as it cools. 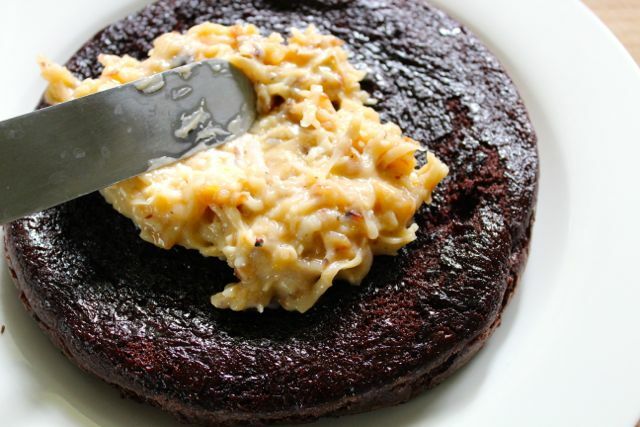 Melt the chocolate and 3 tablespoons of the butter together in a double boiler or the microwave. Set aside. Put the brown sugar into the hot water and stir to dissolve the sugar. Set aside. Place the powdered sugar, 3 tablespoons of the butter, and the cocoa powder in a mixing bowl. Stir or beat on low with a mixer or beaters until somewhat combined (there will be large lumps). With the mixer or beaters on medium speed, pour the chocolate into the cocoa and powdered sugar mixture, beating until combined. Now add one tablespoon of the water-and brown sugar mixture at a time, until the consistency is glossy and smooth. Place one of the layers of cake on a plate. Spread one-third of the coconut custard mixture over it, leaving a little room around the edges. (If the coconut custard is bulging out of the sides of the cake, it will make it difficult to frost.) Repeat with the other two layers. 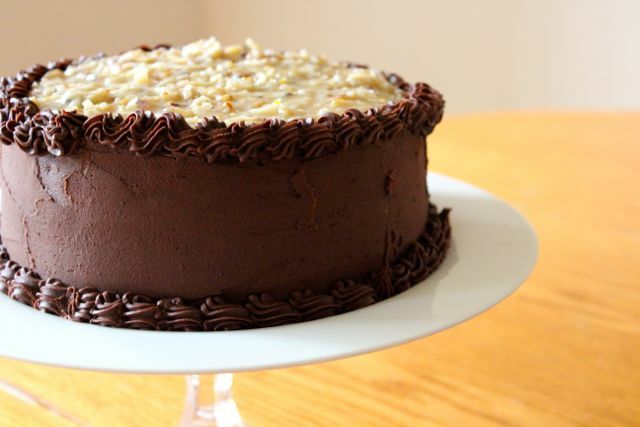 Spread a thin layer of chocolate frosting on the sides of the cake. Pipe around the outside of the top and bottom edges with the remaining frosting. Serve cold. I found this tip online a few years ago, and it has made a world of difference in my cakes. It’s the only way I’ve been able to consistently get flat-topped cakes, which I love, because the layers are much thicker than if I lop off a rounded top. It takes a bit of extra time but is so worth it, in my opinion. 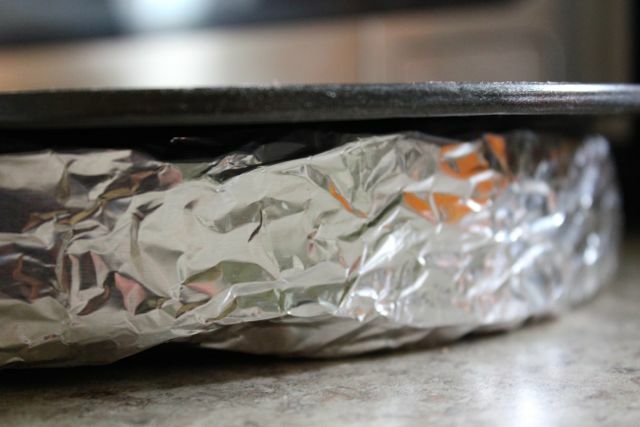 Take a large piece of aluminum foil, a bit longer than the circumference of your cake pan. Fold in half lengthwise, so it is the same length, but not as tall. Rip off a section of paper towel just slightly shorter than the piece of aluminum foil. Get the paper towel damp, but not dripping. Place on one edge of the foil. 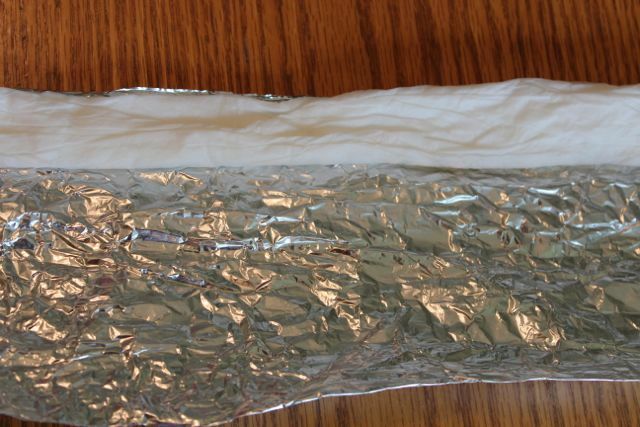 Fold the foil over until the paper towel is encased in the foil, and it is the same height as your cake pan. It should be flat, not cylindrical. Wrap this around the cake pan and pinch together. Bake the cake as you normally would. Hi Rosalie, We sure miss you!